A Utah prosecutor crosses swords with federal investigators. Back in March 2014, Davis County Attorney Troy Rawlings and Salt Lake County District Attorney Sim Gill went on camera, sitting side by side for an interview with ABC News, urging federal prosecutors to investigate a pair of U.S. senators, one of whom was Sen. Harry Reid, D-Nev. Their investigations, they told a reporter, had revealed questionable campaign contributions given by indicted St. George businessman Jeremy Johnson to both senators. Rawlings told the network reporter: "We're not ready to pronounce [the] prosecutions of any federal officials. But I will tell you this: By virtue of somebody being a federal official—be it elected or an appointed official, whatever it is—does not give them immunity from state crime." Twenty months later, in response to emailed questions, Rawlings confirmed to City Weekly that he is investigating Sen. Reid as part of his office's prosecution of former Attorney General Mark Shurtleff on corruption charges. Tired of waiting for the federal government to take action, Rawlings decided to do the job himself, sparking a titanic struggle between Utah and the federal government over just how far a local prosecutor can take a public corruption investigation. According to charging documents from 2014, both Shurtleff and his heir apparent as attorney general, John Swallow, allegedly had dealings and received donations from Jeremy Johnson. Court documents referenced in both cases detail how Johnson sought Swallow's help to ward off civil and criminal investigations into his company, IWorks. Johnson went on to allege Reid's involvement in two bribery schemes. In an email to City Weekly, Rawlings says as a "special assistant Utah attorney general," he has statewide jurisdiction to look "into allegations related to Sen. Reid and others." Further, he said he has obligations as a prosecutor that know "no jurisdictional boundary." According to a legal source close to the Shurtleff case, the Utah Attorney General's Office gave Rawlings the special designation because of the obvious conflicts of interest it would face prosecuting two former AGs. After the Shurtleff and Swallow prosecutions were divided up in December 2014—with Salt Lake County agreeing to prosecute Swallow, and Davis County agreeing to prosecute Shurtleff—Rawlings then sought the authority under Utah Attorney General Sean Reyes to investigate issues involving Shurtleff outside of Davis and Salt Lake County counties—and outside of Utah itself. 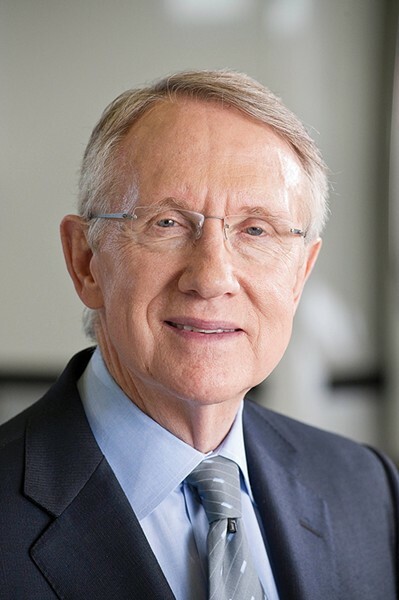 Jeremy Johnson claims that Reid was involved in a pay-to-play bribery scheme focused on gambling, the details of which were published in The Salt Lake Tribune in October 2014. A transcript of a conversation that Johnson recorded between himself and Shurtleff included allegations about a group of online poker business owners who had funneled $2 million to Reid in 2010 to get the most powerful Democrat in the Senate to introduce legislation legalizing online poker. According to a June 6, 2013, Associated Press story, Reid as well as Sen. Jon Kyl, R-Ariz., in 2014 "pursued federal law to legalize Internet poker but ultimately gave up before even introducing the legislation." That wasn't the only time the name of the Mormon Democratic Senate leader—who grew up dirt poor in Searchlight, Nev.—was mentioned in corruption investigations relating to the Utah Attorney General's office. In charging documents filed in 2014 by Davis County and Salt Lake County district attorneys, prosecutors laid out a series of email exchanges between Johnson, Swallow and the late Provo payday-loan magnate Richard Rawle. The charging documents allege that Swallow was helping Johnson send funds through Rawle to a contact close to Reid in hopes of securing a meeting with the senator. Johnson claimed he needed Reid's help to make a Federal Trade Commission case against him disappear. According to court documents, Johnson sent Rawle $250,000, some of which allegedly went to Swallow. Reid's D.C.-based communications director Kristen Orthman issued a statement after City Weekly broke the story of Rawlings investigating Reid, accusing the Davis County Attorney of self-promotion. "This individual has decided to use Sen. Reid's name to generate attention to himself and advance his political career, so every few months he seeks headlines by floating the same unsubstantiated allegations, which he admits have been dismissed by federal prosecutors." Rawlings responded to the statement sarcastically by thanking the spokesperson for, in effect, confirming there had been a prior federal investigation into Reid, albeit one that had apparently led nowhere. He asked Reid's office to, "Please urge the Department of Justice to provide the exonerating evidence and information, so we do not have to litigate the issues in Utah." Rawlings' admission that he is now officially investigating Reid comes after Rawlings' recent attempts to force the DOJ to hand off evidence the FBI and other federal agencies gathered in other investigations. Targets of those investigations included Johnson, Shurtleff and Swallow. Rawlings wants to know, among other things, what the feds did—or did not do—to trace the money that Johnson allegedly gave to Rawle. Historically, state and federal prosecutors have had strong relationships with Utah, says former U.S. Attorney for Utah Brett Tolman, now a high profile white-collar criminal defense attorney. The public brawl between Rawlings and the DOJ "is something that seems very uncharacteristic and unusual. In some ways, it's troubling, because you'd like to think there is full cooperation between those entities that are currently tasked with enforcing our criminal laws—in this case, attempting to hold the former AGs accountable for the allegations that have surfaced against them." Tolman cannot explain the rift between Rawlings and the DOJ but says that until the department says it has turned over everything, "You're going to see Troy Rawlings continue to pursue it," he says. If there are documents out there Rawlings believes can help him prosecute the former Attorney General, "I wouldn't blame him getting everything he can. Whether good for his case or bad for his case, I would want to know about it," Tolman says. Given the adversarial relationship of criminal proceedings, it is notable that Shurtleff's defense team has joined ranks with those prosecuting their client to call for evidence the feds are allegedly holding back. Rawlings maintains Shurtleff has a constitutional right to all the information the feds have gathered. Meanwhile, Shurtleff is also attempting to take the feds to task. He recently made a statement—through his attorneys—criticizing the DOJ and alluding to the fact that he had served as a confidential informant to the FBI and federal prosecutors, feeding both camps information about Johnson's attempt to bribe a U.S. senator. A month ago, Shurtleff's law firm took the highly unusual step of filing a motion in support of Rawlings' request for the feds' evidence. "The DOJ claim that it has produced everything the federal government deems relevant to this prosecution is a classic case of the fox guarding the henhouse," Shurtleff's attorneys wrote. It is, however, curious that the Salt Lake County District Attorney's Office has not joined Davis County in its quest for material from the feds. Shurtleff's lawyers have argued that some of the material the Davis County DA is attempting to wrest from the DOJ could have an even greater impact on Swallow's defense than Shurtleff's. Swallow's attorney Scott Williams did not respond to a voice mail seeking comment. All the same, Rawlings says the Salt Lake County DA's office does not have to follow his lead in investigating Reid, "if, in their judgment, I am off base." He adds that cases can and do end up dismissed "for a prosecutor's knowing failure to pursue and obtain material the defendant is constitutionally entitled to." Part of Rawlings' dual role as a prosecutor is to find evidence that incriminates—but also that can exonerate—Shurtleff, he notes. Salt Lake County District Attorney Sim Gill did not comment as to why his office hasn't joined Davis County in its fight with the feds, but he wrote in an email: "Troy and I have worked the investigation together and are prosecuting the two matters separately. I trust Troy to make the motions he deems necessary for his case, and I assume [he will share] relevant materials ... as we have with him where appropriate." Rawlings writes that he cannot turn away from where the evidence leads him. "To simply ignore and run from what has been presented by multiple witnesses and sources, and the potential impact on the Mark L. Shurtleff case, would mean I am either intentionally blind, or overly worried." An earlier version of this story appeared at CityWeekly.net on Nov. 17, 2015.